When architectural and decorative styles clash, things can get ugly. Exhibit A: this home. It had one foot firmly planted in mid-century modern and the other in what can only be described as '90s rococover-the-top. Two distinct periods, each living uncomfortably side-by-side. 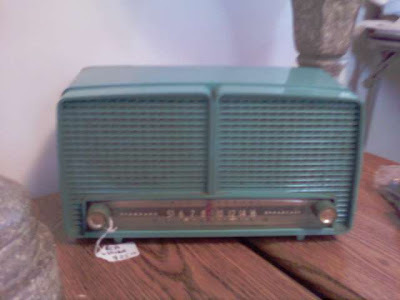 Wish I collected vintage radios. This one was a beauty. You almost expect to turn it on and hear only old news and music. This chair sat nearby. It's worn, but could return to greatness in the right hands. The dining room/kitchen shows exactly what I'm talking about. That vertical-pole divider is pure mid-century. The chandelier above pure something else. Just one corner of the living room, but it sums up everything else in the house. 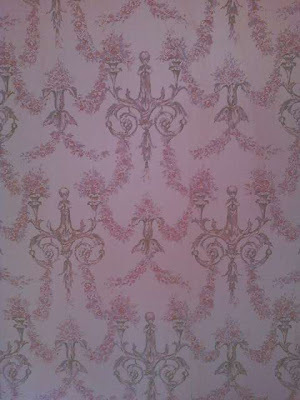 And there was wallpaper. In the bedroom. I found this little lady just off the dining area, toasting the awful fabulousness all around her. The lesson? Never drink and decorate. Sometimes you get a clue early on that you're in for something special. 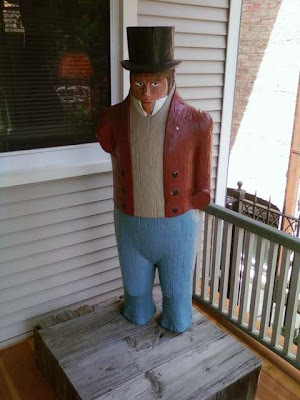 This somber amputee welcomed us at the front porch of a lovingly restored Victorian. Inside was the kind of place that would make my friend Laura weep with envy and frustration. Here's the livingroom. I can imagine that big tree sparkling with a thousand lights and decorations during the holidays, while someone plays carols on that baby grand in the back. That front-porch carving should have been an indication that someone had odd taste in artwork, and that we were in for some startling juxtapositions of decor and decoration. 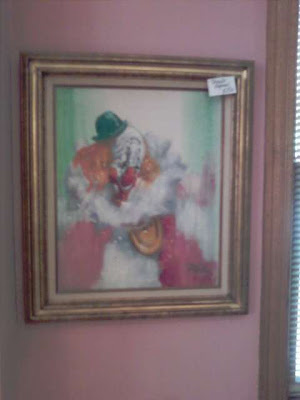 Scary clown painting #2. He seems to be using those black curtains to blow his big red nose. 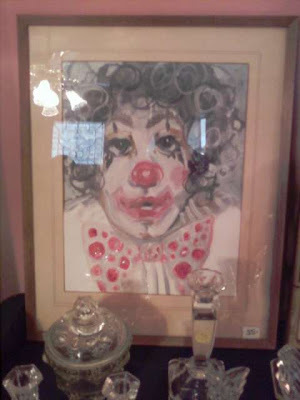 Scary clown painting #3. 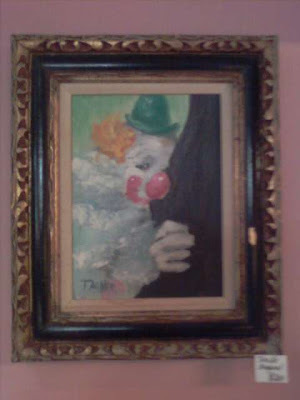 Scary clown statuettes would have been a natural match for the paintings, but I didn't see any. Odd. 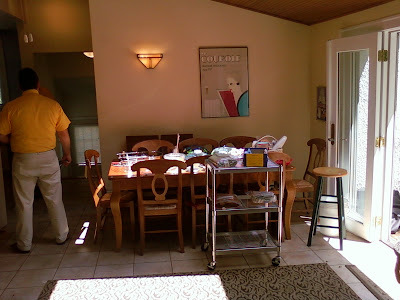 The kitchen/great room combo in the back was really well done, with a stone fireplace off to the left and sliding glass doors leading to a sun room and a big back yard. There were also some records here, a mix of Broadway soundtracks, diva vocalists and disco. Hm. Not exactly what I was expecting. 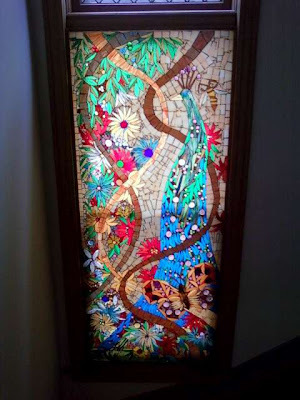 The stairway leading to the second floor was dominated by this stained-glass peacock. More strange artwork at the top of the stairs. Ma'am, please get off that table, put some clothes on and do something about your hair. 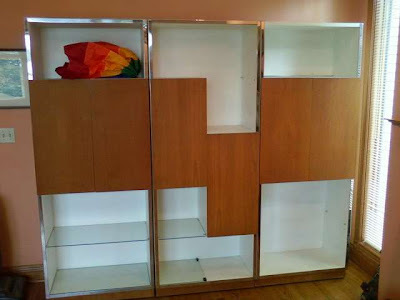 Like so much else in the house, this contemporary shelving unit in one of the upstiars bedrooms just didn't fit, which made it seem to fit any way. And is that a rainbow flag? It is. That would explain a lot. Suddenly, I got the image of a well-off gay couple living here, and everything made sense. The impeccable restoration, the kitschy art choices, the music collection. It all fit. Then, just as I was about to leave, I saw a huge collection of costume jewelery, and once again nothing fit. Purchased: Shirley Bassey, Does Anybody Miss Me? and The Lettermen, Hurt So Bad LPs, $1.50. This place was just a couple blocks away from the first. It was distinguished by an unfinished attic that I didn't get any photos of, unfortunately. 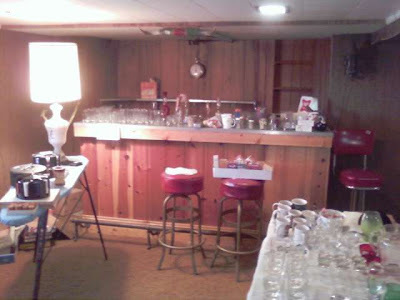 The basement was half-finished, too, but it did have this bar in one corner. In fact, the whole house seemed like it had been left half-finished from the day it was finished. The master bedroom had some very cool mid-century furniture. 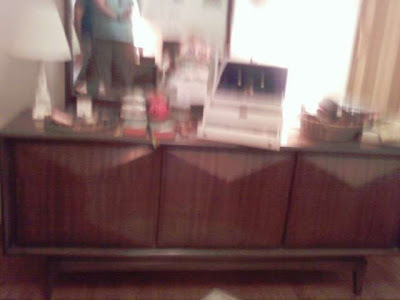 This was the dresser. 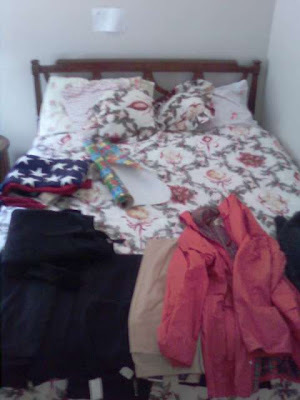 There was a chest of drawers, bedside stand and headboard, too, and they were all in pretty good shape. (Damned camera/phone.) Makes me wish I owned a larger house, or a vintage furniture store. 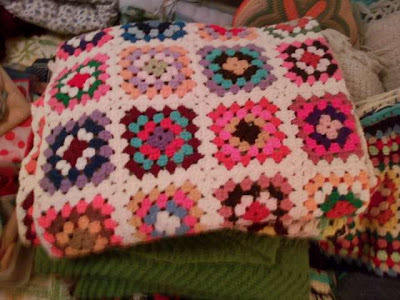 Wouldn't wrapping yourself up in this brighten a cold winter's day? Found in the garage, and proof that some people will try to sell anything. 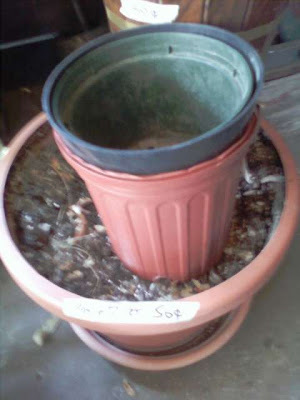 The price tag says, "Pot and dirt 50 cents." Still, quite a bargain for the right buyer. Purchased: Automatic Handy Drink Mixer from the Pink Elephant Series, $1. There are thousands of bungalows in Chicago. They're actually called "Chicago bungalows," and all are pretty much the same, inside and out: brick exterior, living room in front, dining room behind it, two bedrooms off to the (usually right) side, kitchen in back, then some stairs down to the basement and, finally, a sun room overlooking a modest back yard. The rooms were small and a little dingy, and everything in them seemed coated in a thin film of sticky grime. 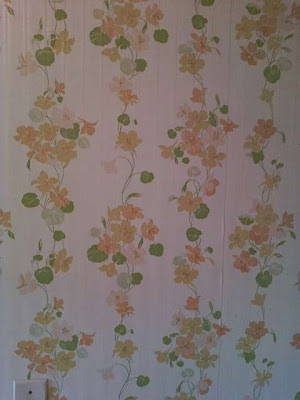 This is the bedroom I think was used most recently. Here's another view of the same room. 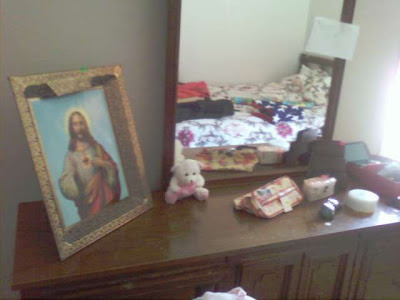 That's a mighty big picture of Jesus for a dresser top. 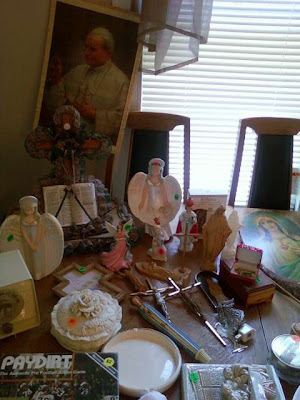 There was a lot of religious paraphernalia gathered together on top of the dining room table. I imagine it was all over the house not too long ago. 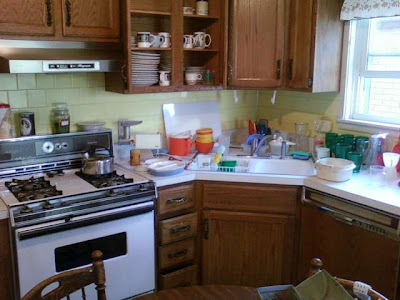 The kitchen was a little depressing, dark wood cabinets and yellowed yellow tile. 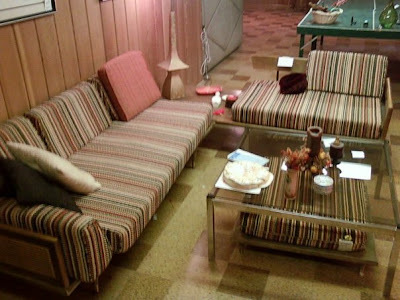 It was easy to imagine someone shuffling into it on worn house slippers and making coffee, morning after morning, for forty-some years. I expected the basement to be gray cinderblock, with a crooked-looking washer and dryer sitting in one dark corner next to a dripping utility sink. Maybe some worn wooden shelves holding a lifetime's worth of Mason jars, old vases from Valentine's and Mother's Days past, and a collection of canned food going back to the Nixon era. So this surprised me. It was bright and surprisingly airy for a basement. That picture was pretty funky -- a distant sci-fi city beneath a giant yellow sun, and now I wish I'd gotten a close-up of it. And there were records -- stuff from the '60s-'80s. Tom Jones. Englebert Humperdink. Donna Summer. Commodores. Lipps, Inc. It would have been a bonanza for me, but they were priced at $3 each, which qualifies as estate sale robbery in my book. Also some Playboys from 1967, which seemed a strange contrast with the religious items upstairs. The sacred and profane, one on display up above, the other hidden away down beneath. Purchased: The Lettermen, Reflections; Jack Jones, Bewitched and Christmas with Jack Jones LPs, $7. There were just enough clues in this place to really pique my curiosity about the people who lived there. Someone must have worked in advertising or marketing, because there were a lot of award books and Communication Arts magazines left behind. I also found some graphics arts supplies, drawing pens, and a lot of photo equipment in the garage. 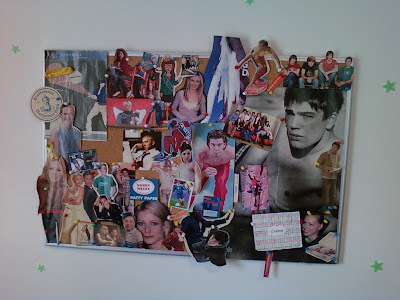 They had kids -- at least one teenage girl, from the looks of this bulletin board. I got the impression she'd grown up and moved away, but the parents had kept her bedroom the same. That was probably five or ten years ago, judging from the celebrities she liked. Either that or the daughter was hopelessly behind the times. There seems to be an unspoken rule that you don't ask about the people. But sometimes -- if you're discreet -- you can get a little info. After one of the workers had chatted me up I quietly inquired about the family who'd left all this stuff behind. At first he looked around, to see who else was nearby. When he saw we were alone he leaned in and whispered, "Let's just say it was ugly." He shook his head. "Divorce." I hope they'll all be happier soon. Purchased: Up With People LP for $1. 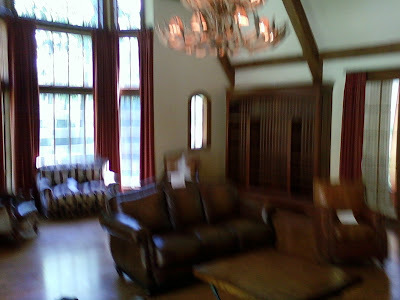 It's too bad the following photos turned out so blurry, because this was one of the grandest houses I'd ever seen outside the pages of a magazine. Sometimes the camera on my phone just isn't as reliable as I'd like. Especially in low light. The place was gigantic, recently built, and strangely empty. 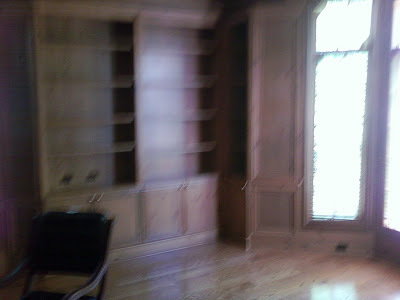 This is just one corner of the wood-paneled library. The dining room off to the left was enormous, and must have seated at least twenty judging by the number of chairs still lined up against its dark-green walls. I took a picture, but it didn't turn out. This is a large, lodge-like den with twenty-foot ceilings. That's an antler chandelier above. Behind me was an immense fieldstone fireplace that climbed all the way up the wall, with a moosehead hanging from it. I took a picture but it also didn't turn out. I bet this was a nice room to be in when it was snowing. 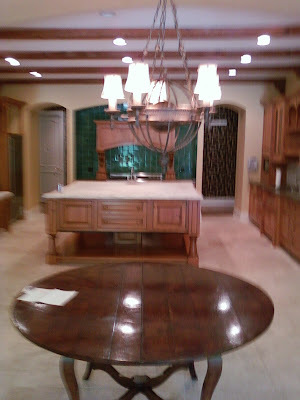 Here's one side of a kitchen/great room combo, with French doors leading out to a pool behind me. 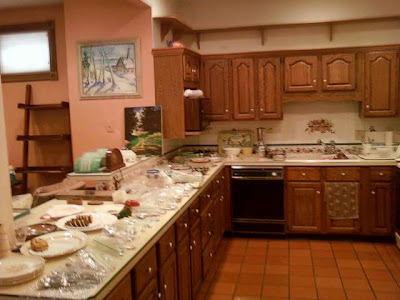 This was one of two kitchens. 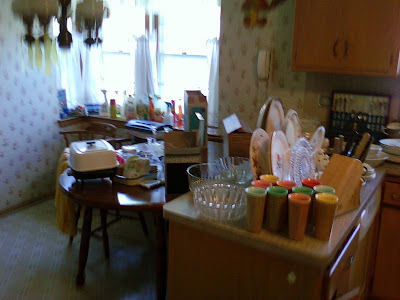 Just outside that doorway to the right was a second, smaller service kitchen for the dining room. 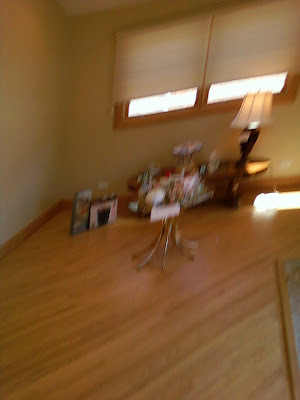 Most estate sales are held after someone passes away. But sometimes you get the impression something else happened. This sale was one of those, and it smelled like financial ruin to me. Winnetka is one of Chicago's wealthiest suburbs, but there are a lot of homes for sale up there these days. Another clue that hinted at scandal of some sort: all the trees had been recently TP'ed. It didn't seem coincidental. It was a perfectly typical house on Chicago's northwest side. It even had a nice little addition behind the kitchen. Looking at it from the outside -- at least during most of the year -- you never would have guessed the sheer volume of merriment it contained. 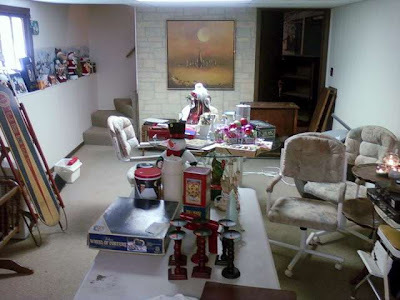 Down in the basement was a treasure trove of holiday decorations. Hundreds -- perhaps thousands -- of them. 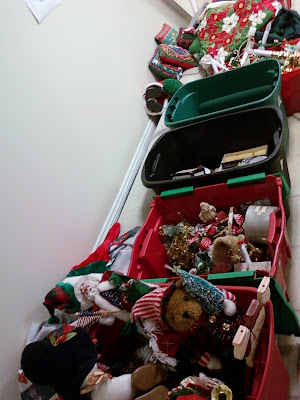 Bins and bins of holiday decorations. Bears in Christmas finery. Wreaths and garland. Christmas tree ornaments. A whole village of snow-capped Victorian buildings. And not just Christmas, either. 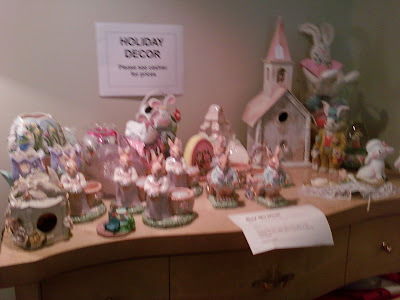 Easter was also represented. And Halloween and Thanksgiving. I think there was even some St. Patrick's Day stuff in there. 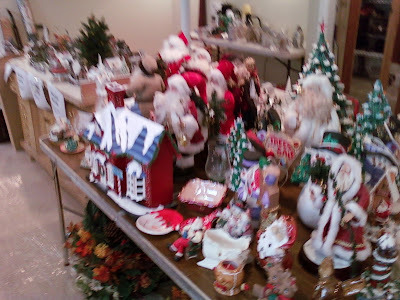 It was kind of sad to see all that Christmas stuff piled up together in the middle of June. But I bet this place truly sparkled from Thanksgiving through New Year's. Purchased: Peggy Lee I'm a Woman LP for $1. It was a tidy three-bedroom ranch in Park Ridge. 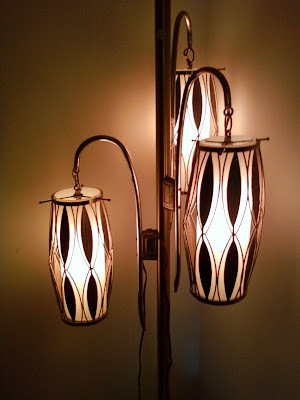 This lamp was just inside the entryway. I should have bought it. Found in one of the bedrooms. 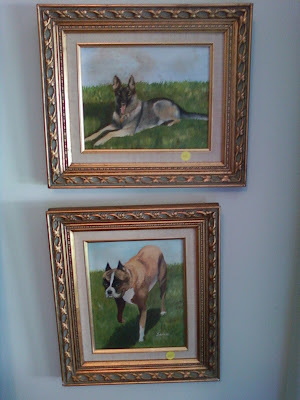 Someone had a thing for portraits of dogs. Hanging on an adjacent wall. 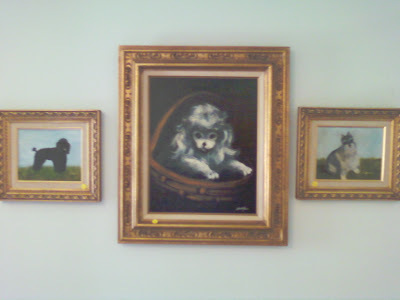 Someone really had a thing for portraits of dogs. 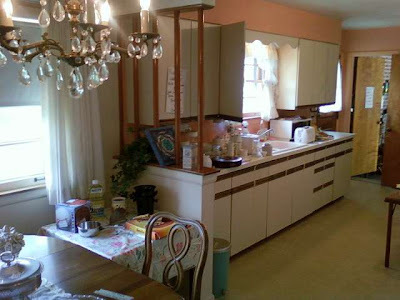 The kitchen, which hadn't been touched since some time in the seventies. 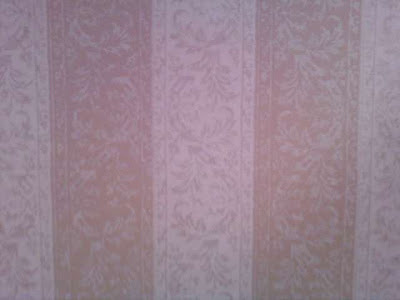 Note the juxtaposition of wallpaper and floor covering, and the faux-Colonial lamp. 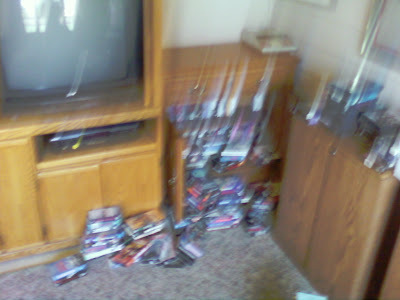 An unfortunately blurry photo of just one corner of a sad little TV room off the kitchen, with tons of videos and DVDs of crime and horror films. 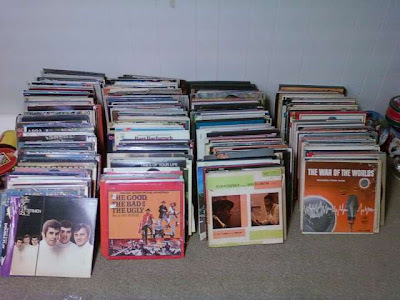 Purchased: Eight LPs from the '60s for $.50 each; an unworn blue polo shirt from the '70s. 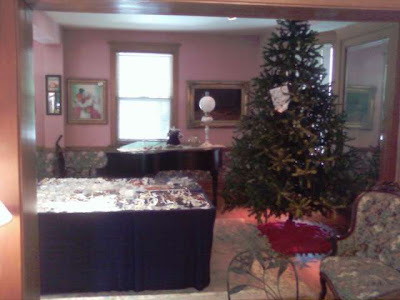 Simply put, because estate sales are fascinating. 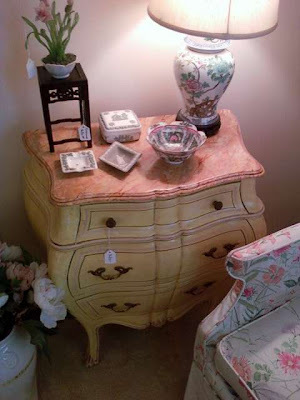 If you're in love with vintage stuff -- clothes, housewares, furniture, you name it -- estate sales are the best place to find it. If you're a fan of residential architecture, estate sales are an opportunity to experience all kinds of it up close and personal. Every era and style eventually turns up. If you're interested in how other people live, estate sales reveal the inner worlds of folks richer, poorer and just plain different from you. And during a sale, very little is off limits. Curious about what's in the linen closet, the medicine cabinet, the bedside nightstand, the junk drawer? Take a look. What you find might surprise you. If you're even the tiniest bit skeptical about America's consumerist society, estate sales are proof that all the material goods you work so hard to acquire over the course of your life are worth mere pennies on the dollar once you're finished with them. 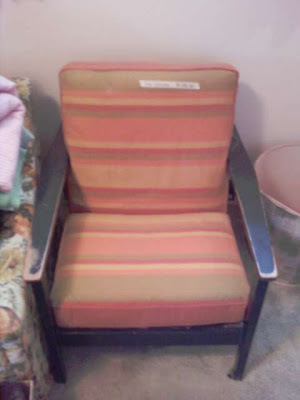 And finally, if you enjoy a good story, estate sales are a terrific source for them. You certainly don't get the whole story -- at least not most of the time -- but the things a person leaves behind still manage to speak volumes about who they were, what they cared about, how they lived and why they're gone.